Catesby's first opportunity to travel to America came through a family connection. His sister, Elizabeth, had married Dr. William Cocke and the two lived in Williamsburg, Virginia. Cocke had become involved in Colonial politics and provided Catesby with introductions to the many of the ruling class in Virginia, including William Byrd, who would also provide support for Catesby's second trip to the Colonies. Catesby arrived in Virginia on April 23, 1712. It was seven years before he would return to England. Except for a visit to Jamaica in 1714, he spent his time in Virginia, traveling through the Tidewater and up the James River towards the Appalachians. He observed and sketched local flora and fauna. He also collected botanical specimens for Samuel Dale and for Thomas Fairchild, whose nursery at Hoxton Catesby often mentions in the Natural History. 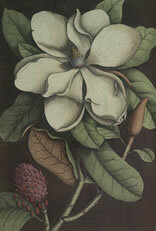 Happily for Catesby, Sherard had just begun plans to send a naturalist to America. He lobbied several of his influential friends and colleagues to select Catesby for this role. Catesby's backers were not only men of science and politics, but also business men, who clearly stood to gain from the as yet unknown natural resources of America. Among such men was Charles Dubois, merchant and former treasurer of the East India Company. 7 Catesby included a list of sponsors on page vi of the preface to Volume I. 8 Without such support, Catesby could not have made this second trip to America, yet this support would come at a price.